I was familiar with the Common Jezebel since a few years. When it flutters high near the tiny flowers up on our tall Fiddlewood Tree, I can recognize this. It neither comes down much nor sits anywhere on smaller flowering plants closer to the ground, at least as far as I have observed in the last 5-6 years. So I had to content with long shots. Remember to click on pictures to get enlarged views. This was really high up, zoomed to the camera's max. So is the picture below. Both shots of Fiddlewood flowers. They love its nectar and the flowers are very fragrant. On 23.11.2007, I saw one just above my eye level resting on a big leaf of the Almond Tree. This was the first time I was getting a close look. And I had the camera on hand. Slowly, slowly I approached it closer. It stayed still. I was like a thief looking to rob some macro photo-shoots! I kept clicking lest it should fly, until my camera lens was as close as two inches! I wondered why it was so still! A little while later, I guessed that it must have become a butterfly just then after I saw [by enlarging the shot I took up close, on camera playback] the fresh matt-finish wings getting to dry. This was the shot. This post is dedicated to Nancy Polanski, because the Common Jezebel always reminds me of her beautiful gesture and greeting card. Let us come to the present now. Four days ago, i.e., on the morning of 21.11.2013, I went to the stone bench beside the pond, with coffee in hand as is my wont,. This magnificent butterfly was on the leaf of Jaquemontia growing on the arch next to the pond. As I sat, it was in level to my shoulder. 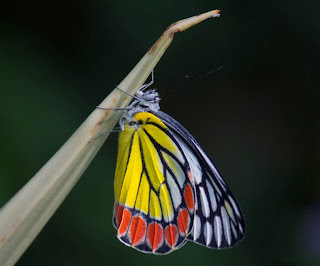 So I now knew - from the Plain Tiger experience - that this was another newly emerged butterfly if it were to sit still like that and that too so near to ground level. This time, I had to run in and return with the camera. What followed for the next 45 minutes was joy. My coffee got cold mid way. This was where I spotted it. There was one empty chrysalis seen towards the left here but that was of the Plain Tiger. I was to discover its chrysalis the next day. I wanted to have close shots but there were shadows where it was. So I held a dry leaf at its feet. It crawled up on it. I carried it slowly and held it up in sunlight. I allowed it to crawl on to an Agave leaf. But it could not hold on. It fell down from there after I took a few quick shots. I suddenly remembered Beverly [from the post on Plain Tiger]. She had written that these will need to 'hang' down in which position fluid from the abdomen runs freely into the wings and make it rigid for flight. I also observed later that its feet are hook-like at the tip to enable them to hang and grip. I picked the fallen Jezebel with my finger. It crawled up and then transferred to a blade of grass. I took a macro shot of its face also, with the camera lens almost touching the antenna. I took shots in all sort of lighting while I made sure it stayed face up. It flew and sat on the gate as if to test its wings. Newly painted gate, retains its sheen! Picked it up on the grass again. This time, for a back-lit shot of the wing, held against the sun. Newly opened wings will appear like freshly pressed shirts opened from its folded state and will have pronounced mat finish. The latter is not noticeable to the naked eye. Thanks to technology we are able to see so much beyond the eye's ability. So do not forget to click on the picture below. I wished it good luck and good bye and went my way, leaving it safe and comfortable on some plant. Thank you Nancy and Beverly. Dinu, this lady Jezebel, though her name may be 'common', knows that her beauty is anything but common. She loves to tease you and dares you to take her photo. She poses for you in the hope that she will catch your eye and your heart. Thank you for mentioning the cards I sent you. I am surprised to see one of them pictured in your blog. Surprised, and very pleased that you would still remember it. That was quite a few years ago. I am honored, Dinu. As we discussed, I would love to make another one for you. I will be asking you soon to send me another shot of greater resolution. Have you one particular photo in mind? If not, I shall make that decision myself.